The $998 Sony FE 24-240mm f3.5-6.3 OSS (FE 24-240mm) is a wide-angle through to long telephoto superzoom for the full-frame Sony A7 series. Packing a 10x zoom, it’s ideal for Sony shooters who want the flexibility of shooting wide-angle landscapes, or zooming in to concentrate on the wildlife, without that frustrating business of having to change lenses. Covering such a wide focal range, a “fast” fixed aperture would have made the lens unfeasible, so instead the FE 24-240mm offers a variable f3.5-6.3 maximum aperture, which lets in around 1.5 stops’ less light at 240mm than at 24mm. That means getting fast shutter speeds at the long end of the zoom is going to be a challenge unless you’re working in pretty good light. The inclusion of Sony’s Optical SteadyShot (OSS) image stabilization system will help to some degree, however, allowing you to use slower shutter speeds without images suffering from camera shake. The lens barrel itself is dust- and moisture-resistant, but as the Sony A7 series lenses aren’t considered fully weatherproof, it’s probably wise to exercise some caution in challenging conditions. Even with a variable aperture, the FE 24-240mm still needs some pretty chunky glass to cover that focal range, resulting in a lens that weighs 780g — almost twice as heavy as the Sony A7R camera body itself! 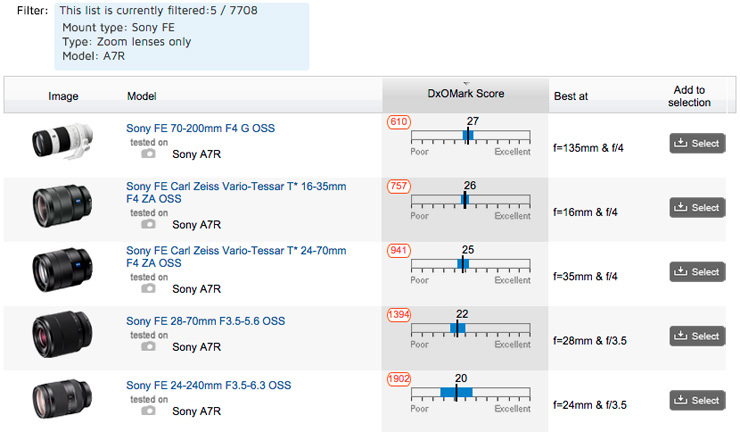 Achieving a DxOMark Score of 20 points, the FE 24-240mm ranks fairly low down in the overall rankings in our lens database. 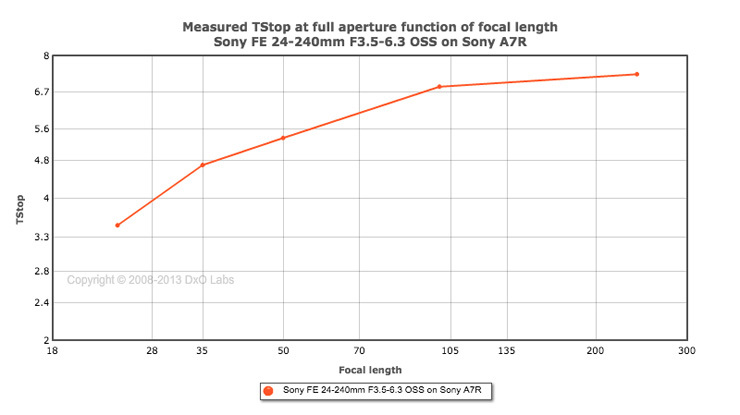 Charting ninth for all FE-mount lenses tested, the FE 24-240mm has the lowest score for all FE-mount optics we’ve tried on the Sony A7R. 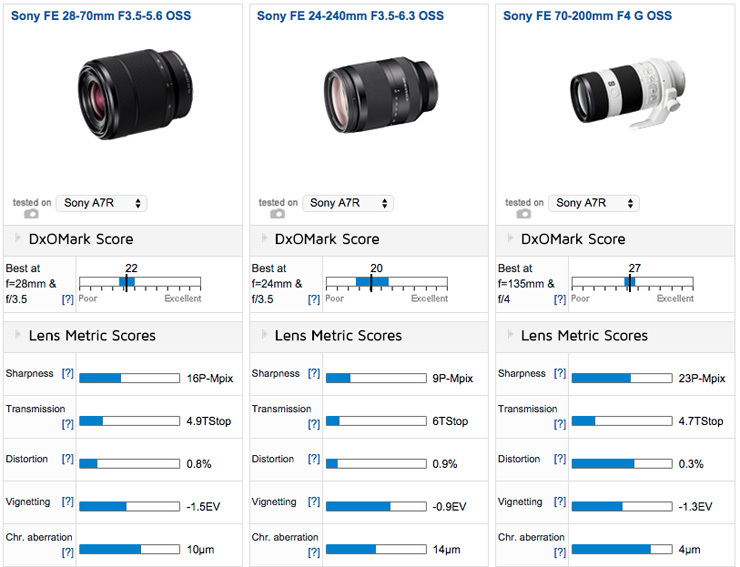 To be fair, the low score isn’t surprising, given the nature of the lens, and as previously stated, good DxOMark scores are rare for Superzoom lenses. In fact, in terms of overall scores, the FE 24-240mm isn’t very far behind the FE 28-70mm f3.5-5.6 OSS at 22 points, which offers a much shorter focal range and only a 2.5x zoom. 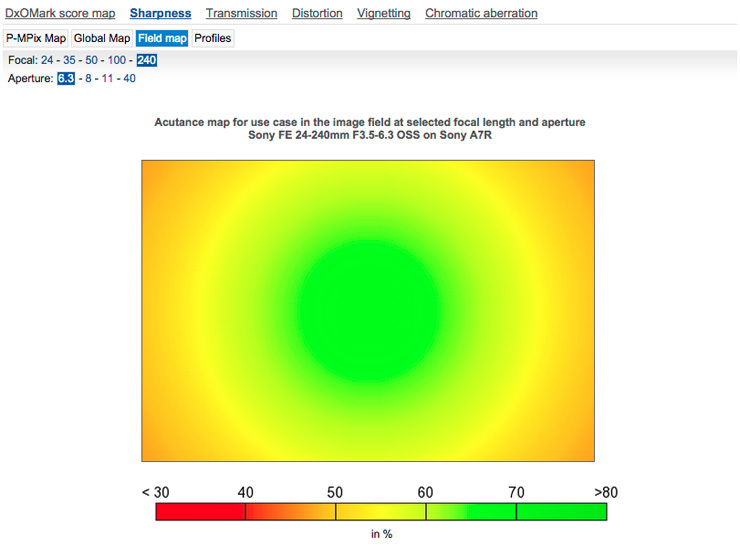 If we look a little more in detail at the lens metric scores, we get a clearer picture of the strengths and weaknesses of this lens. An overall Sharpness score of 9P-Mpix is pretty disappointing, considering we’re testing it on a 36P-Mpix camera, and it’s a result that’s well down even against the FE 28-70mm. 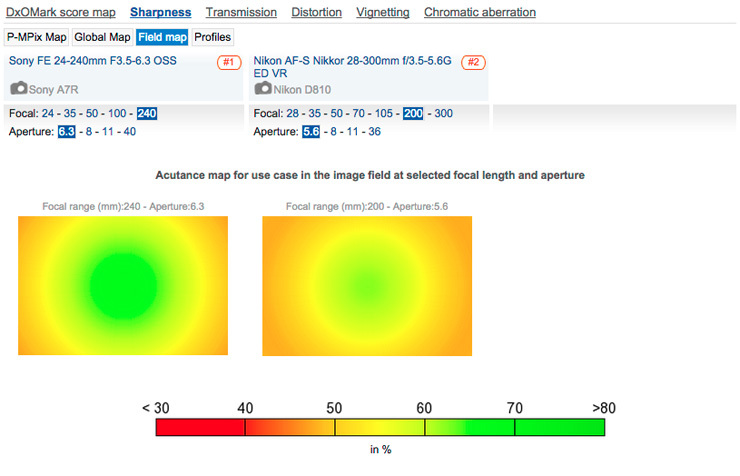 The overall Sharpness map indicates better resolution recorded by the FE 24-240mm at the wider focal lengths up to a maximum aperture of f/11. 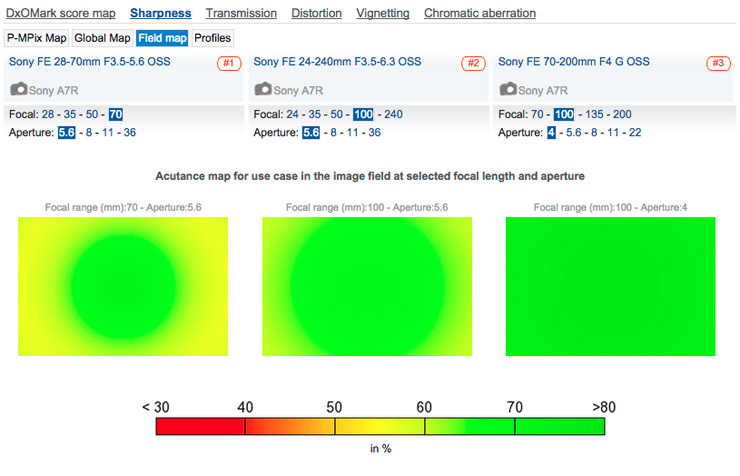 Further analysis of the Sharpness field maps also shows reasonably homogenous sharpness between 24-50mm up to f/11, but at 100mm, overall sharpness is weaker, with edges starting to drop off, and by 240mm, edge softness is quite pronounced at all aperture settings. A very low Distortion score of 0.9% is the result of heavy barrelling at 24mm, which is going to be an issue for shooting wildlife and especially for architectural photography. Zoom in just a little to 35mm and Distortion is better controlled, however, so it’s only really a problem if you need or want to shoot at the widest focal length. Achieving an overall DxOMark Score of 20 points, the FE 24-240mm ranks in last place for all FE mount lenses we’ve tested, including primes and zooms. 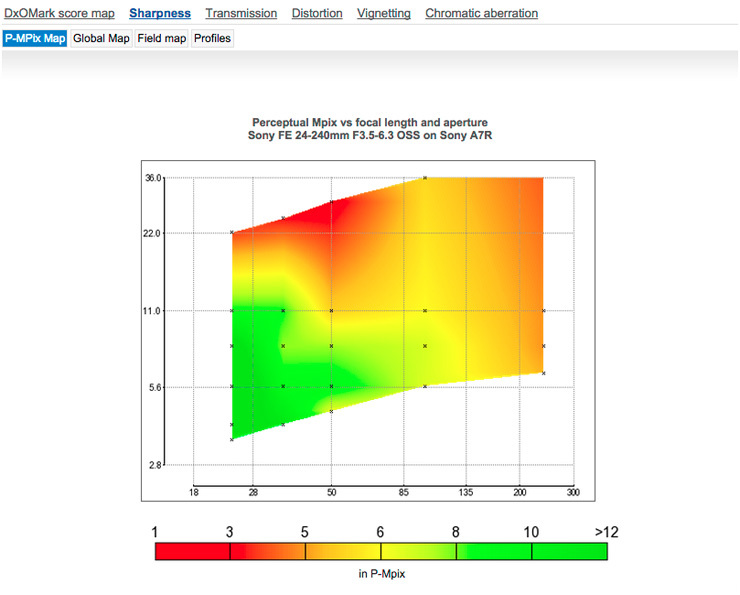 The Sharpness P-Mpix map for the FE 24 – 240mm highlights that the lens has better resolution both at the wider focal lengths and at the wider maximum aperture settings. Fully zoomed-in at 240mm using the maximum aperture of f6.3, sharpness is far from homogenous, with noticeable resolution drop-off evident in the corners. The Transmission chart shows light transmission of 3.4TStop at the wider focal lengths, which isn’t too bad, but fully-zoomed Transmission drops to over 7Tstop, resulting in a dark viewfinder. At 24mm, barrel distortion is very pronounced on the 24-240mm, but zooming in to just 35mm significantly reduces distortion and between 35- 240mm, it’s well-controlled. With the physics involved in the optical construction, zoom lenses generally have some strengths and some weakness, and so will perform better at one end of the focal range. As discussed, superzooms are great for convenience, but if you shoot more wide-angle or more telephoto, you need to know if which end of your superzoom is a strength or a weakness. To get some greater perspective on this, we’ve pitted the FE 24-240mm against the $498 FE 28-70mm f3.5-5.6 OSS (FE28-70mm) standard zoom and the $1,498 FE 70-200mm f4 G OSS (FE 70-200mm) telephoto zoom. With the highest overall score of 27 achieved on the FE 70-200mm and 22 on the FE 28-70mm, the FE 24-240mm drops to third place for these FE zooms with just 20 points. 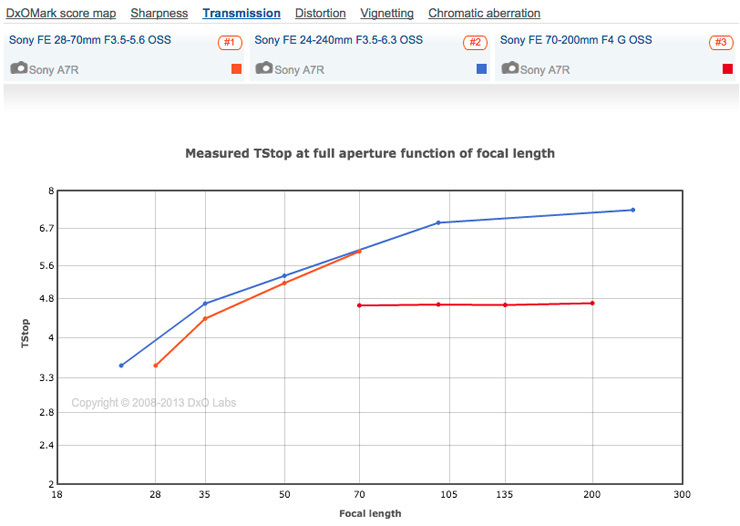 Although it’s not too far behind the FE 28-70mm, overall sharpness is well down on the superzoom, with its Lens Metric Score of just 9P-Mpix significantly behind the FE 28-70mm with 16P-Mpix and miles off the FE 70-200mm with 23P-Mpix. The FE 24-240mm’s overall sharpness score is affected by its relatively poor performance at the long end of the zoom, but at the wider focal lengths it’s actually slightly stronger than its FE 28-70mm counterpart. This is true particularly at the wider aperture settings where the 24-240mm superzoom displays better edge sharpness compared to the FE 28-70mm. As mentioned, sharpness at the telephoto end of the FE 24-240mm superzoom is more problematic, however, and compared to the dedicated FE 70-200mm telephoto, it pales in comparison. For portraits at a 100mm focal length, the 70-200mm offers greater and more homogenous resolution, as well as that “faster” f4 aperture for better background bokeh. Zoom in to 200mm and the FE 70-200mm remains significantly stronger, with edge softness on the FE 24-240mm evident. 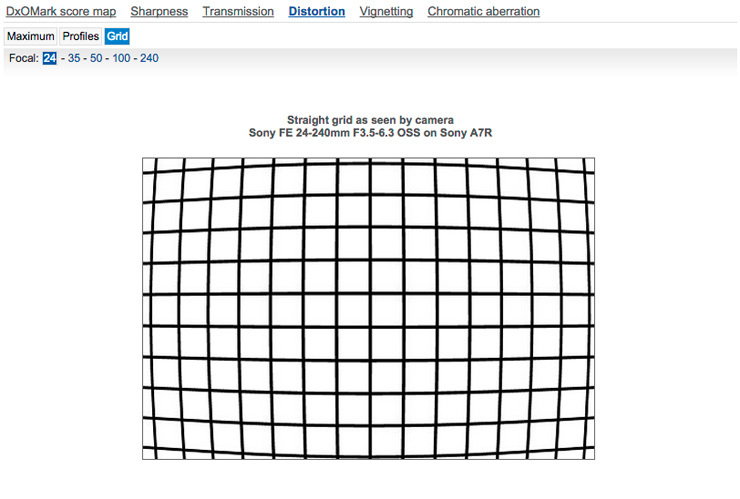 It’s a similar picture for Transmission, where there’s not much between the FE 28-70mm and the FE 24-240mm. Zoom in to 200mm on the superzoom, however, and Transmission drops markedly, with the FE 70-200mm offering over two stops’ better transmission than the 24-240mm, which will have a noticeable impact on viewfinder brightness when shooting at 200mm. For Distortion, the FE 28-70mm has less barrel at 28mm, compared to the FE 24-240 at 24mm, but you only need to zoom in a notch to 35mm to even things out. Similarly, the FE 70-200mm also has less pincushion at 200mm than the FE 24-240mm at 240mm, but again, there’s not that much in it. At the widest focal length of 24mm on the FE 24-240mm and 28mm on the FE 28-70mm, using the maximum f3.5 aperture, the standard zoom offers better edge-to-edge resolution. At 70mm on the standard zoom compared to 100mm on the FE 24-240mm, however, the tables are turned, with the superzoom offering better sharpness across the frame at f5.6. At the longest focal length against a dedicated telephoto zoom, the FE 24-240mm isn’t nearly as strong, however, with the FE 70–200mm boasting better results at 200mm f4. Transmission between the FE 24-240mm and FE 28-70mm is similar, but the FE 70-200mm is over two TStops brighter than the FE 24-240mm between 100mm and 200mm. At the widest 24mm focal length, the 24-240mm displays significantly stronger barrel distortion compared to the 28-70mm at 28mm. For a final comparison and to put the relatively low scores of a superzoom into more context, we’ve compared the FE 24-240mm against the Nikon 28-300mm f3.5-5.6G ED VR attached to the Nikon D810. With both the D810 and A7R boasting a 36Mp sensor resolution and using each manufacturer’s prestige full-frame-format superzoom, it’s an interesting analysis to see if either has an edge. 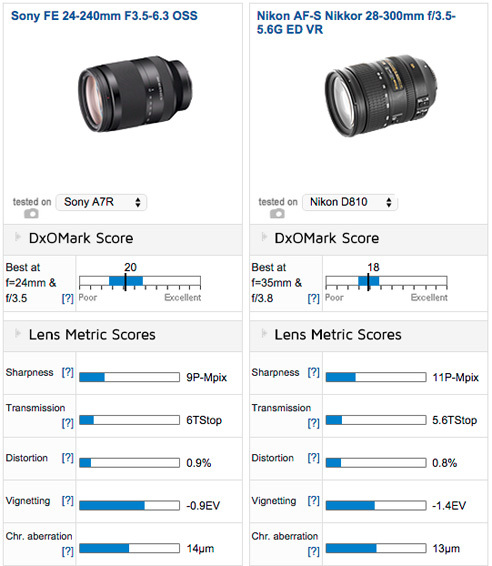 In terms of overall scores, the Sony configuration just has the edge with a DxOMark Score of 20 compared to 18 for the Nikon set up. Tables are turned for Sharpness, however, and while both cameras are towards the lower end of the spectrum, the Nikon lens metric of 11P-Mpix is ahead of the Sony, with just 9P-Mpix. 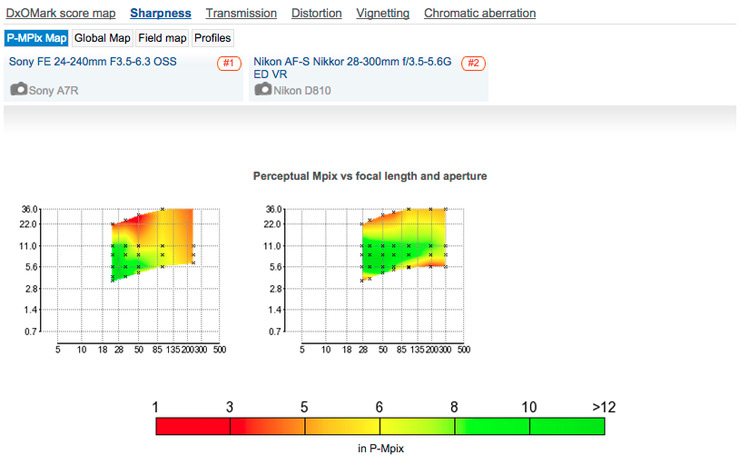 The Sharpness P-MPix map for both camera/lenses indicates that resolution on the Nikon holds up slightly better overall, and most particularly at the longer focal lengths compared to the Sony. The FE 24-240mm is better than the Nikon with the lens aperture wide open, however, and this is true at both ends of the focal range. The Sony set also displays less vignetting with the aperture wide open, and although this can be corrected in post-production, it provides further evidence that the FE 24-240mm performs marginally better than the Nikon at the wider aperture settings. For the lens metrics of Transmission, Distortion and Chromatic Aberration, there’s not much to choose between the two setups. 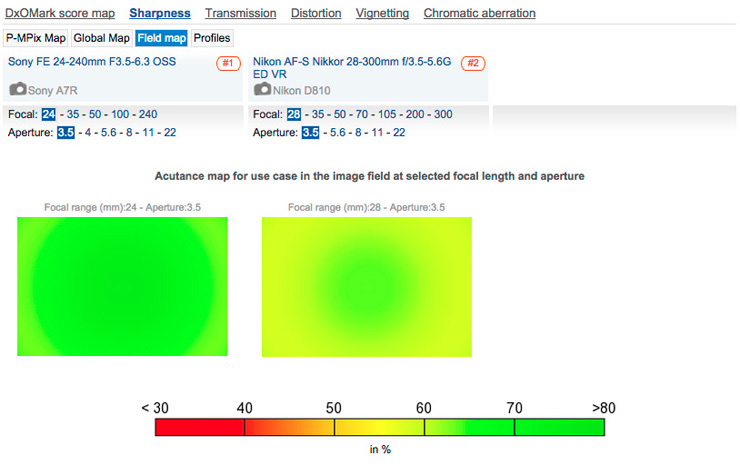 The Sharpness P-MPix Map analysis indicates that the Nikon superzoom is sharper across more of the focal range, with the green areas extended up to 200mm compared to 85mm for the Sony. At the widest focal length using the maximum aperture, however, the FE 24-240mm is both sharper and more homogenous than the Nikon superzoom at the same settings. Although both lenses display obvious edge softness at 200/240mm, at maximum aperture the Sony FE 24-240mm is sharper in the center and across more of the frame. 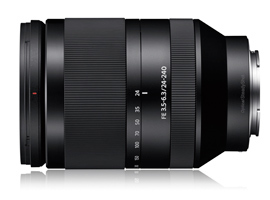 Costing $998, the FE 24-240mm is not very cheap, but packing a massive 10x focal range, Sony’s OSS image stabilization and dust/moisture resistant construction, you get a lot of lens for your money. While offering a versatile all-in-one solution for wide-angle or long telephoto shots without having to change lenses, the FE 24-240mm is not the strongest optically and ranks in the lower half of our lens database. 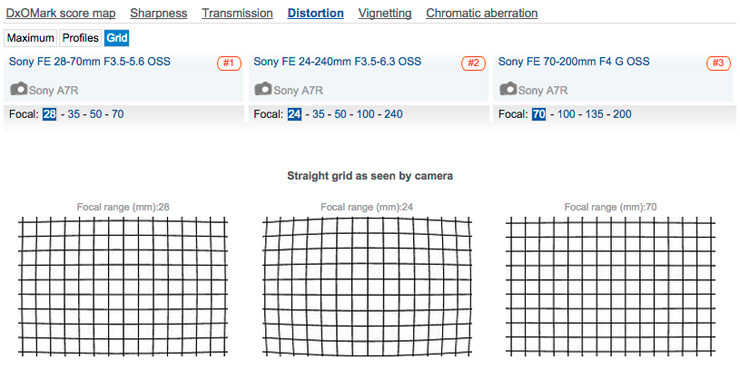 That said, the image quality delivered by the FE 24-240mm is good for a superzoom, and as we’ve seen in the Sony FE 24-240mm vs Nikon 28-300mm analysis, the Sony is as good in most areas and actually slightly better than the Nikon at the wider apertures. The FE 24-240mm’s performance is also better at the wider focal lengths between 24-50mm. Zoom in further to the telephoto focal lengths and Sharpness and Transmission start to suffer somewhat, which has affected its overall score. Head-to-head against the $1,498 FE 70-200mm f4 G OSS, the analysis showed that much better performance is available from a dedicated telephoto zoom with more homogenous sharpness across the entire frame. At the wider focal lengths, however, the FE 24-240mm actually displays better edge sharpness than the FE 28-70mm standard zoom, which covers a much shorter focal range. So if you’re looking for a good quality standard zoom with the added versatility of being able to shoot telephoto without changing lenses, the FE 24-240mm is a convenient and good value choice for Sony A7 shooters.